"... And so do his sisters, and his cousins, and his aunts! So sang Cousin Hebe and the chorus of female admirers accompanying Sir Joseph Porter, KCB, First Lord of the Admiralty, as he came aboard H.M.S. Pinafore. More than once, W.S. 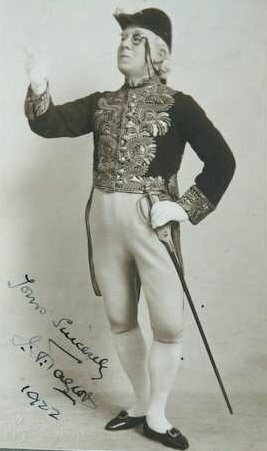 Gilbert had his operatic characters remark on matters genealogical. This reference suggests the size and intermingling of the extended Victorian family - and, indeed Sir Joseph marries Hebe at the end of Act 2. Genealogy is defined as an account of the descent of a person, family, or group from an ancestor or from older forms (2, 3). The fundamental presumption is that all individuals in a family line share a consanguineous or blood relationship which confirms a genetic link between them. The way in which any individual is related to any other individual in this scheme is described as his / her kinship. In kinship terminology, a cousin is a relative with whom one shares one or more common ancestors although the term is not usually used when referring to members of the immediate family. We are generally very familiar with the ways in which we describe our relatives within the nuclear family. In the English-speaking world we would recognise a brother and a sister as being the sibling children of their parents (mother and father). These siblings would also be aware that their parents each had a mother and a father, giving them two sets of grandparents. If their parents, themselves, had brothers and sisters, the children would acknowledge them as uncles and aunts who in return would acknowledge the children as their nephews and nieces. In our specimen three generation family (Chart 1), the nuclear family members are coloured yellow. Children of the third generation, Adam and Susan Smith, are brother and sister. Their parents are Fred Smith and Liz White. Their grandparents are John Smith and Ann Brown (Fred's parents) and the parents of Liz White (names not shown). Fred Smith has a sister - Jane - who is Adam and Susan's aunt and they are Jane's nephew and niece. Even within these apparently simple boundaries we can start adding a layer of complexity. Both Adam and Susan may marry. His wife becomes Susan's sister-on-law, whilst Susan's husband becomes Adam's brother-in-law. Adam's wife (as does Susan's husband) now recognises Fred and Liz Smith as her father-in-law and mother-in-law. Finally in this section, what of the relationship between Jane's husband and the children. Are the people married to your aunts and uncles also your aunts and uncles? Clearly he is Fred Smith's brother-in-law but has no blood tie to the family. The answer will depend upon the beliefs and traditions of the family and individuals concerned. Technically, upon marriage to Jane, he becomes uncle-in-law to the children. If divorce subsequently ensues, he becomes ex-uncle-in-law. Common usage in the English language, however, accepts that married siblings of your parents are your aunts and uncles. It is when we step outside the nuclear family that the real confusions and misunderstandings come into play with such expressions as second cousin three times removed and third cousin twice removed. As stated above, a cousin is someone in your family tree who shares with you a common ancestor. A two-part nomenclature has developed to describe the actual relationship. The "degree" describes of the relationship of you and your cousin to that common ancestor. Bearing in mind that your parents are excluded from the calculation, the first common ancestors that you can share are your grandparents. So, first cousins share grandparents (but not parents); second cousins share great grandparents (but not parents or grandparents) and so on. The two points to remember are: the "degree" is always one less than the number of generations between you and your common ancestor; and that you and your cousin are at the same number of generations away from that common ancestor. For this section, the nuclear family has been been extended by two generations (Chart 2). For clarity, the generations have been given separate colours. Adam and Susan Smith share common ancestors (grandparents John Smith and Ann Brown) with Peter Jones. They are therefore first cousins (blue). Adam Smith and Peter Jones married and both had families. Walter Smith shares common ancestors (this time great grandparents) with Lucy and Rebecca Jones. They are second cousins (red). 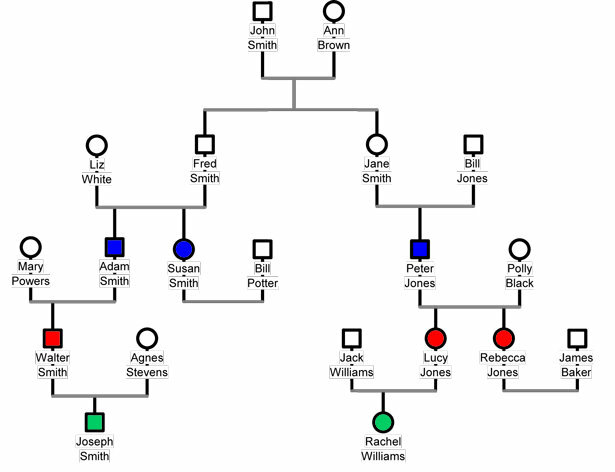 When Walter Smith and Lucy Jones both get married and have families, their children, Joseph Smith and Rachel Williams are third cousins (green). They share great great grandparents. This example can be extended back as many generations as you have information. The "removed" element is applied to the descendent children of a cousin and describes the number of generations there are between the specific cousin pairs. So, the child of your first cousin is your first cousin once removed. The child is still considered a first cousin as the most recent common ancestor is your grandparent (their great grandparent) giving a "degree" of one. The grandchild of your first cousin is your first cousin twice removed and so on. The two points to remember here are: the "degree" is derived from your common ancestor, the "removal" is the number of generations between your cousin's descendent and you. In our extended family, we recall that Peter Jones and Adam Smith are first cousins. Peter Jones daughters, Lucy and Rebecca, are also first cousins to Adam Smith but that relationship is "once removed" because the girls are one more generation further away from the common ancestor than Adam. Lucy's daughter, Rachel, (Peter Jones granddaughter) is also first cousin to Adam Smith but the relationship is now "twice removed". Taking this one step further, Rachel is Walter Smith's second cousin once removed. We work this relationship from Rachel's mother, Lucy Jones and Walter Smith being second cousins (sharing common great grandparents) and Rachel being one generation removed from Walter. So far, we have looked at a fairly simple family tree with the branches spreading outwards from a single root. What happens, however, when branches become intertwined or fractured? This leads to a whole raft of new scenarios and definitions. Let's look first at the situation of cousin marriage. Attitudes to the idea of cousins marrying one another vary widely around the world. In some jurisdictions and cultures such unions are considered ideal and are actively encouraged; in some they are uncommon but still legal; and in others they are seen as incestuous and legally prohibited (4). Marriages between first and second cousins are thought to account for 10% of marriages worldwide - reaching up to 50% in some countries, especially where marriages are arranged. It is not illegal in the UK. There are several examples of cousin marriage in our own database. Indeed, there is a property in one village called "Craxford House", so named by the original owner to celebrate the fact that both his grandmothers - first cousins once removed - were Craxfords. Such a scenario is represented in the third chart. Rachel Williams and Joseph Smith (third cousins) marry and so, form their own nuclear family. All the protagonists now take on multiple relationships. We have already seen that she is Walter Smith's second cousin once removed but now he also becomes her father-in-law. Similarly Joseph Smith is Rebecca Jones second cousin once removed, but she now becomes his aunt. Perhaps this would represent the linkages forged in Sir Joseph Porter and Cousin Hebe's family tree. The next generation becomes even more interesting. Joseph and Rachel have two children, Peter and Carol Smith. 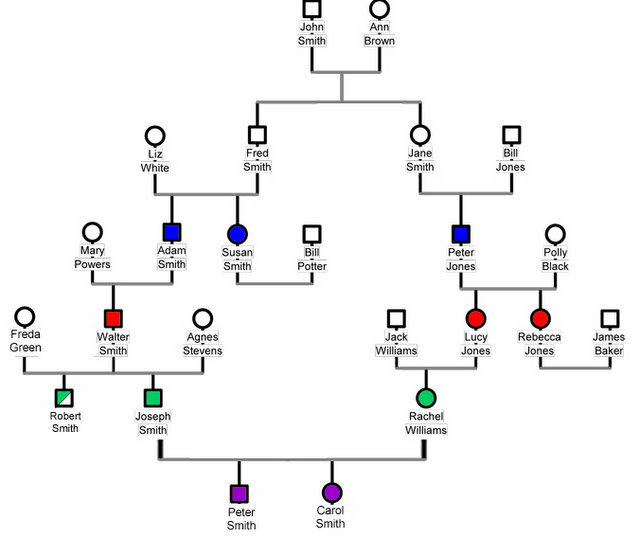 As well as being siblings, they also share great great great grandparents (John Smith and Ann Brown) making them double fourth cousins (purple). The expression "double" is applied when the relationship with the common ancestors is shared through both sides of the family tree. They are also both the grandchildren and first cousins twice removed of Walter Smith. Similar entangled relationships can be derived between individuals thoroughout the tree. Unfortunately another complication arises in the family! Whether through divorce or death, Walter Smith departs from his first wife, Agnes and marries again. With Freda Green, he has a son Robert. 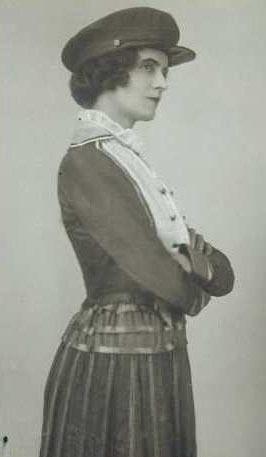 Freda becomes Joseph Smith's stepmother while Joseph and Robert are half brothers. These two terms can be added to any of the foregoing cousin relationships. Peter and Carol are Robert Smith's half nephew and niece whilst Robert himself is Peter Jones' half first cousin twice removed. Similarly after a divorce, Agnes Stevens becomes Rachel's ex-mother-in-law being replaced by Freda Green as her stepmother-in-law. With all this ever-developing compexity, it is of little surprise that, away from purely genealogical usage, most families eliminate the nuances of degrees and removals. People with common ancestors are merely alluded to as "cousins" (where there is a close social contact within the family) or "distant cousins" (where the contact is much less defined). A variant of this is the "kissing" cousin where the participants are known well enough to be kissed when greeted! * Linda Ellis is the author and webmaster of A Family Story: A study of the people of Desborough. Her chart "Cousins ... first, second ... once removed" forms the basis of this article.